Citation Information: J Clin Invest. 1999;103(10):R39-R43. https://doi.org/10.1172/JCI6460. We identified the α-cardiac actin gene (ACTC) as a novel disease gene in a pedigree suffering from familial hypertrophic cardiomyopathy (FHC). Linkage analyses excluded all the previously reported FHC loci as possible disease loci in the family studied, with lod scores varying between –2.5 and –6.0. Further linkage analyses of plausible candidate genes highly expressed in the adult human heart identified ACTC as the most likely disease gene, showing a maximal lod score of 3.6. Mutation analysis of ACTC revealed an Ala295Ser mutation in exon 5 close to 2 missense mutations recently described to cause the inherited form of idiopathic dilated cardiomyopathy (IDC). ACTC is the first sarcomeric gene described in which mutations are responsible for 2 different cardiomyopathies. We hypothesize that ACTC mutations affecting sarcomere contraction lead to FHC and that mutations affecting force transmission from the sarcomere to the surrounding syncytium lead to IDC. Citation Information: J Clin Invest. 1999;103(10):1371-1377. https://doi.org/10.1172/JCI4338. Generalized atrophic benign epidermolysis bullosa is an autosomal recessive subepidermal blistering disease typified by null mutations in COL17A1. In 1 large kindred, affected individuals were homozygous for a 2-bp deletion in COL17A1, 4003delTC, which resulted in a downstream premature termination codon, nonsense-mediated mRNA decay, and abrogation of type XVII collagen synthesis. Interestingly, 1 of these patients, although phenotypically identical to her affected siblings, showed focal expression of type XVII collagen in epidermal basement membrane in a pattern suggestive of revertant mosaicism. When studies of randomly obtained epidermal, oromucosal, and peripheral blood cells failed to identify the genetic basis of this apparent mosaicism, microscopic subpopulations of potentially revertant epidermal cells (i.e., those overlying basement membrane containing type XVII collagen) were selectively isolated using laser capture microdissection. Analysis of DNA and RNA from these cells revealed a second mutation, 4080insGG, on 1 allele of COL17A1. This 2-bp insertion corrected the reading frame just proximal to the premature termination codon, countered nonsense-mediated mRNA decay, and allowed protein production by patient keratinocytes in vivo and in vitro. These studies elucidate the molecular basis of a novel form of revertant mosaicism in humans. Citation Information: J Clin Invest. 1999;103(10):1379-1389. https://doi.org/10.1172/JCI5731. Heterologous expression of the cystic fibrosis transmembrane conductance regulator (CFTR) provided evidence that the major cystic fibrosis (CF) mutation ΔF508 leads to defective protein folding in the endoplasmic reticulum, which prevents its processing and targeting to the cell surface. In this study, we investigated endogenous CFTR expression in skin biopsies and respiratory and intestinal tissue specimens from ΔF508 homozygous and non-CF patients, using immunohistochemical and immunoblot analyses with a panel of CFTR antibodies. CFTR expression was detected at the luminal surface of reabsorptive sweat ducts and airway submucosal glands, at the apex of ciliated cells in pseudostratified respiratory epithelia and of isolated cells of the villi of duodenum and jejunum, and within intracellular compartments of intestinal goblet cells. In ΔF508 homozygous patients, expression of the mutant protein proved to be tissue specific. Whereas ΔF508 CFTR was undetectable in sweat glands, the expression in the respiratory and intestinal tracts could not be distinguished from the wild-type by signal intensity or localization. The tissue-specific variation of ΔF508 CFTR expression from null to apparently normal amounts indicates that ΔF508 CFTR maturation can be modulated and suggests that determinants other than CFTR mislocalization should play a role in ΔF508 CF respiratory and intestinal disease. Citation Information: J Clin Invest. 1999;103(10):1391-1398. https://doi.org/10.1172/JCI5863. Previous studies proposed a dynamic, steady-state relationship between HIV-mediated cell killing and T-cell proliferation, whereby highly active antiretroviral therapy (HAART) blocks viral replication and tips the balance toward CD4+ cell repopulation. In this report, we have analyzed blood and lymph node tissues obtained concurrently from HIV-infected patients before and after initiation of HAART. Activated T cells were significantly more frequent in lymph node tissue compared with blood at both time points. Ten weeks after HAART, the absolute number of lymphocytes per excised lymph node decreased, whereas the number of lymphocytes in the blood tended to increase. The relative proportions of lymphoid subsets were not significantly changed in tissue or blood by HAART. The expression levels of mRNA for several proinflammatory cytokines (IFN-γ, IL-1β, IL-6, and macrophage inflammatory protein-1α) were lower after HAART. After therapy, the expression of VCAM-1 and ICAM-1 — adhesion molecules known to mediate lymphocyte sequestration in lymphoid tissue — was also dramatically reduced. These data provide evidence suggesting that initial increases in blood CD4+ cell counts on HAART are due to redistribution and that this redistribution is mediated by resolution of the immune activation that had sequestered T cells within lymphoid tissues. Citation Information: J Clin Invest. 1999;103(10):1399-1408. https://doi.org/10.1172/JCI2887. The CCAAT/enhancer binding protein ε (C/EBPε) is a nuclear transcription factor expressed predominantly in myeloid cells and implicated as a potential regulator of myeloid differentiation. We show that it was rapidly induced in the acute promyelocytic leukemia (APL) cell line NB4 during granulocytic differentiation after exposure to retinoic acid (RA). Our data suggest that induction of C/EBPε expression was through the retinoic acid receptor α (RARα) pathway. Reporter gene studies showed that C/EBPε promoter/enhancer activity increased in a retinoid-dependent fashion via the retinoic acid response element (RARE) present in the promoter region of C/EBPε. The RA-induced expression of C/EBPε markedly increased in U937 myelomonoblasts that were induced to express promyelocytic leukemia/RARα (PML/RARα), but not in those induced to express promyelocytic leukemia zinc finger/RARα (PLZF/RARα). In retinoid-resistant APL cell lines, C/EBPε either is not induced or is induced only at very high concentrations of RA (≥10–6 M). In addition, forced expression of C/EBPε in the U937 myelomonoblastic leukemia cells mimicked terminal granulocytic differentiation, including morphologic changes, increased CD11b/CD66b expression, and induction of secondary granule protein expression. Our data strongly suggest that C/EBPε is a downstream target gene responsible for RA-induced granulocytic differentiation of APL cells. Citation Information: J Clin Invest. 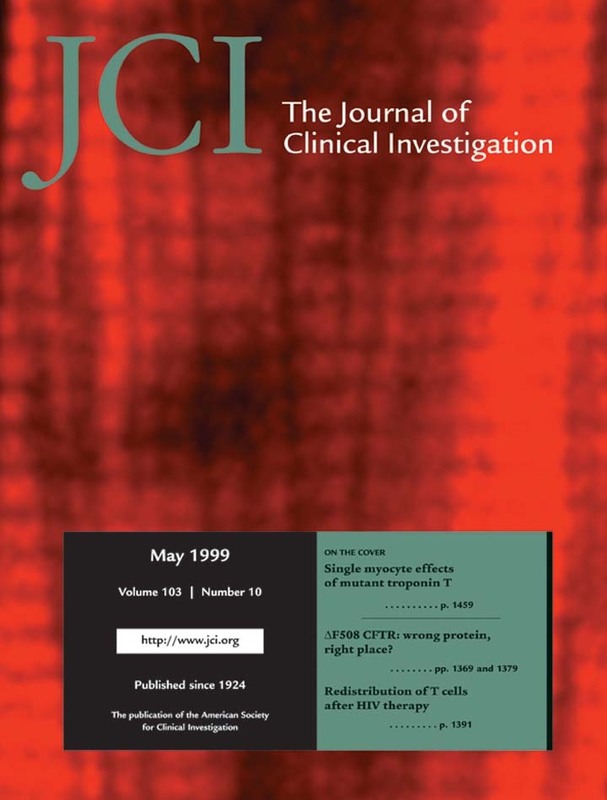 1999;103(10):1409-1418. https://doi.org/10.1172/JCI4682. Declining estrogen levels during the first postmenopausal decade lead to rapid bone loss and increased fracture risk that can be reversed by estrogen replacement therapy. The bone-protective effects of estrogen may involve suppression of inflammatory cytokines that promote osteoclastogenesis and bone resorption, such as IL-1, TNF-α, and IL-6. We investigated whether estrogen modulates IL-1 actions on human osteoclasts (OCs) and other bone cell types. Isolated human OCs and primary bone marrow–derived OC-like cells expressed both the signaling (IL-1RI) and decoy (IL-1RII) IL-1 receptors, whereas only IL-1RI was detected in osteoblasts. IL-1RII/IL-1RI mRNA ratios and release of soluble IL-1RII (sIL-1RII) were lower in OC-like cells derived from women in the late postmenopausal period compared with younger women, but were unrelated to male donor age, suggesting that estrogen might play a role in regulating IL-1 receptor levels in vivo. Estrogen directly reduced in vitro OC-like cell IL-1RI mRNA levels while increasing IL-1RII mRNA levels and sIL-1RII release. These estrogenic events were associated with inhibited IL-1–mediated cytokine (IL-8) mRNA induction and cell survival, i.e., increased apoptosis. In contrast, estrogen did not alter IL-1R levels or IL-1 responsiveness in primary human osteoblasts or bone marrow stromal cells. We conclude that one novel mechanism by which estrogen exerts bone-protective effects may include a selective modulation of IL-1R isoform levels in OC or OC-like cells, thereby reducing their IL-1 responsiveness and cell survival. Conversely, this restraint on IL-1 actions may be lost as estrogen levels decline in aging women, contributing to an enhanced OC-mediated postmenopausal bone loss. Citation Information: J Clin Invest. 1999;103(10):1419-1430. https://doi.org/10.1172/JCI4921. Apo B-100 of LDL can bind to both the LDL receptor and megalin, but the molecular interactions of apo B-100 with these 2 receptors are not completely understood. Naturally occurring mutant forms of apo B may be a source of valuable information on these interactions. Apo B-70.5 is uniquely useful because it contains the NH2-terminal portion of apo B-100, that includes only one of the two putative LDL receptor–binding sites (site A). The lipoprotein containing apo B-70.5 (Lp B-70.5) was purified from apo B-100/apo B-70.5 heterozygotes by sequential ultracentrifugation combined with immunoaffinity chromatography. Cell culture experiments, ligand blot analysis, and in vivo studies all consistently showed that Lp B-70.5 is not recognized by the LDL receptor. The kidney was identified as a major organ in catabolism of Lp B-70.5 in New Zealand white rabbits. Autoradiographic analysis revealed that renal proximal tubular cells selectively removed Lp B-70.5. On ligand blotting of renal cortical membranes, Lp B-70.5 bound only to megalin. The ability of megalin to mediate cellular endocytosis of Lp B-70.5 was confirmed using retinoic acid/dibutyryl cAMP–treated F9 cells. This study suggests that the putative LDL receptor–binding site A on apo B-100 might not by itself be a functional binding domain and that the apo B–binding sites recognized by the LDL receptor and by megalin may be different. Moreover, megalin may play an important role in renal catabolism of apo B truncations, including apo B-70.5. Citation Information: J Clin Invest. 1999;103(10):1431-1436. https://doi.org/10.1172/JCI5241. Leukocyte 12-lipoxygenase (12-LO) gene expression in pancreatic β cells is upregulated by cytotoxic cytokines like IL-1β. Recent studies have demonstrated that 12-LO inhibitors can prevent glutamate-induced neuronal cell death when intracellular glutathione stores are depleted. Therefore, 12-LO pathway inhibition may prevent β-cell cytotoxicity. To evaluate the role of 12-LO gene expression in immune-mediated islet destruction, we used 12-LO knockout (12-LO KO) mice. Male homozygous 12-LO KO mice and control C57BL/6 mice received 5 consecutive daily injections of low-dose streptozotocin to induce immune-mediated diabetes. Fasting serum glucose and insulin levels were measured at 7-day intervals, and the mice were followed up for 28 days. 12-LO KO mice were highly resistant to diabetes development compared with control mice and had higher serum insulin levels on day 28. Isolated pancreatic islets were treated with IL-1β, TNF-α, and IFN-γ for 18 hours. Glucose-stimulated insulin secretion in cytokine-treated islets from C57/BL6 mice decreased 54% from that of untreated islets. In marked contrast, the same cytokine mix led to only a 26% decrease in islets from 12-LO KO mice. Furthermore, cytokine-induced 12-hydroxyeicosatetraenoic acid (12-HETE) production was absent in 12-LO KO islets but present in C57/BL6 islets. Isolated peritoneal macrophages were stimulated for 48 hours with IFN-γ + LPS and compared for nitrate/nitrite generation. 12-LO KO macrophages generated 50% less nitrate/nitrite when compared with C57BL/6 macrophages. In summary, elimination of leukocyte 12-LO in mice ameliorates low dose streptozotocin–induced diabetes by increasing islet resistance to cytokines and decreasing macrophage production of nitric oxide. Citation Information: J Clin Invest. 1999;103(10):1437-1449. https://doi.org/10.1172/JCI5409. In normal individuals, γδ T cells account for less than 6% of total peripheral T lymphocytes and mainly express T-cell receptor (TCR) Vδ2-Vγ9 chains. We have previously observed a dramatic expansion of γδ T cells in the peripheral blood of renal allograft recipients only when they developed cytomegalovirus (CMV) infection. This increase was long lasting (more than 1 year), was associated with an activation of γδ T cells, and concerned only Vδ1 or Vδ3 T-cell subpopulations. Analysis of γδ TCR junctional diversity revealed that CMV infection in these patients was accompanied by (a) a marked restriction of CDR3 size distribution in Vδ3 and, to a lesser extent, in Vδ1 chains; and (b) a selective expansion of Vδ1 cells bearing recurrent junctional amino acid motifs. These features are highly suggestive of an in vivo antigen-driven selection of γδ T-cell subsets during the course of CMV infection. Furthermore, Vδ1 and Vδ3 T cells from CMV-infected kidney recipients were able to proliferate in vitro in the presence of free CMV or CMV-infected fibroblast lysates but not uninfected or other herpes virus–infected fibroblast lysates. This in vitro expansion was inhibited by anti-γδ TCR mAb’s. These findings suggest that a population of γδ T cells might play an important role in the immune response of immunosuppressed patients to CMV infection. Citation Information: J Clin Invest. 1999;103(10):1451-1458. https://doi.org/10.1172/JCI5056. To characterize the mode of action of angiotensin II (Ang II) in cardiac remodeling, we generated chimeric mice that are made of both homozygous Ang II receptor type 1A gene (Agtr1a) null mutant cells and Agtr1a intact cells expressing the lacZ gene (ROSA26). Both Agtr1a null and intact myocytes and interstitial cells independently form areas that are randomly distributed throughout the heart. The distribution of ROSA26 cardiomyocytes overlaps completely with that of Ang II binding, indicating that the majority of Ang II receptors reside on cardiomyocytes. When Ang II (1 ng/g body weight/min) was infused for 2 weeks, mice developed mild to moderate hypertension. The proliferating cardiac fibroblasts identified by bromodeoxyuridine staining were present predominantly in the areas surrounded by Agtr1a intact cardiomyocytes. When control chimeric mice made of wild-type cells and ROSA26 cells (i.e., both carrying intact Agtr1a) were infused with Ang II, fibroblast proliferation was found equally in these cardiomyocyte types. When compared with Agtr1a null mutant chimeras, the control chimeras had more extensive cardiac fibrosis, most prominently in perivascular regions. Therefore, in response to Ang II, cardiac fibroblasts proliferate through both the local and systemic action of Ang II. Importantly, the former is determined by the Ang II receptor of neighboring cardiomyocytes, indicating that a communication between myocytes and fibroblasts plays an important role during Ang II–dependent cardiac remodeling. Citation Information: J Clin Invest. 1999;103(10):1459-1467. https://doi.org/10.1172/JCI6377. The direct effects of expressing hypertrophic cardiomyopathy–associated (HCM-associated) mutant troponin T (TnT) proteins on the force generation of single adult cardiac myocytes have not been established. Replication-defective recombinant adenovirus vectors were generated for gene transfer of HCM-associated I79N and R92Q mutant cardiac TnT cDNAs into fully differentiated adult cardiac myocytes in primary culture. We tested the hypothesis that the mutant TnT proteins would be expressed and incorporated into the cardiac sarcomere and would behave as dominant-negative proteins to directly alter calcium-activated force generation at the level of the single cardiac myocyte. Interestingly, under identical experimental conditions, the ectopic expression of the mutant TnTs was significantly less (∼8% of total) than that obtained with expression of wild-type TnT (∼35%) in the myocytes. Confocal imaging of immunolabeled TnT showed a regular periodic pattern of localization of ectopic mutant TnT that was not different than that in normal controls, suggesting that mutant TnT incorporation had no deleterious effects on sarcomeric architecture. Direct measurements of isometric force production in single cardiac myocytes demonstrated marked desensitization of submaximal calcium-activated tension, with unchanged maximum tension generation in mutant TnT–expressing myocytes compared with control myocytes. Collectively, these results demonstrate an impaired expression of the mutant protein and a disabling of cardiac contraction in the submaximal range of myoplasmic calcium concentrations. Our functional results suggest that development of new pharmacological, chemical, or genetic approaches to sensitize the thin-filament regulatory protein system could ameliorate force deficits associated with expression of I79N and R92Q in adult cardiac myocytes. Citation Information: J Clin Invest. 1999;103(10):1469-1477. https://doi.org/10.1172/JCI6400. Prostaglandin G and H synthases, or cyclooxygenases (COXs), catalyze the formation of prostaglandins (PGs). Whereas COX-1 is diffusely expressed in lymphoid cells in embryonic day 15.5 thymus, COX-2 expression is sparse, apparently limited to stromal cells. By contrast, COX-2 is predominant in a subset of medullary stromal cells in three- to five-week-old mice. The isozymes also differ in their contributions to lymphocyte development. Thus, experiments with selective COX-1 inhibitors in thymic lobes from normal and recombinase-activating gene-1 knockout mice support a role for this isoform in the transition from CD4–CD8– double-negative (DN) to CD4+CD8+ double-positive (DP). Concordant data were obtained in COX-1 knockouts. Pharmacological inhibition and genetic deletion of COX-2, by contrast, support its role during early thymocyte proliferation and differentiation and, later, during maturation of the CD4 helper T-cell lineage. PGE2, but not other PGs, can rescue the effects of inhibition of either isoform, although it acts through distinct EP receptor subtypes. COX-dependent PG generation may represent a mechanism of thymic stromal support for T-cell development.